The Netflix website in 2006 had numerous vulnerabilities to CSRF, which could have allowed an attacker to perform actions such as adding a DVD to the victim's rental queue, changing the shipping address on the account, or altering the victim's login credentials to fully compromise the account. The online banking web application of ING Direct was vulnerable to a CSRF attack that allowed illicit money transfers. Popular video website YouTube was also vulnerable to CSRF in 2008 and this allowed any attacker to perform nearly all actions of any user. New attacks against web-enabled devices were carried out in 2018, including attempts to change the DNS settings of routers. Some router manufacturers hurriedly released firmware updates to improve protection, and advised users to change router settings to reduce the risk. Details were not released, citing "obvious security reasons". Attacks were launched by placing malicious, automatic-action HTML image elements on forums and email spam, so that browsers visiting these pages would open them automatically, without much user action. People running vulnerable uTorrent version at the same time as opening these pages were susceptible to the attack. When accessing the attack link to the local uTorrent application at localhost:8080, the browser would also always automatically send any existing cookies for that domain. This general property of web browsers enables CSRF attacks to exploit their targeted vulnerabilities and execute hostile actions as long as the user is logged into the target website (in this example, the local uTorrent web interface) at the time of the attack. A cross-site request forgery is a confused deputy attack against a web browser. It involves sites that rely on a user's identity. It exploits the site's trust in that identity. It tricks the user's browser into sending HTTP requests to a target site. It involves HTTP requests that have side effects. At risk are web applications that perform actions based on input from trusted and authenticated users without requiring the user to authorize the specific action. A user who is authenticated by a cookie saved in the user's web browser could unknowingly send an HTTP request to a site that trusts the user and thereby causes an unwanted action. Because of this assumption, many existing CSRF prevention mechanisms in web frameworks will not cover GET requests, but rather apply the protection only to HTTP methods that are intended to be state-changing. An attacker may forge a request to log the victim into a target website using the attacker's credentials; this is known as login CSRF. Login CSRF makes various novel attacks possible; for instance, an attacker can later log into the site with his legitimate credentials and view private information like activity history that has been saved in the account. This attack has been demonstrated against Google and Yahoo. Different HTTP request methods have different levels of susceptibility to CSRF attacks and require different levels of protection due to their different handling by web browsers. In HTTP GET the CSRF exploitation is trivial, using methods described above, such as a simple hyperlink containing manipulated parameters and automatically loaded by an IMG tag. By the HTTP specification however, GET should be used as a safe method, that is, not significantly changing user's state in the application. Applications using GET for such operations should switch to HTTP POST or use anti-CSRF protection. In simplest form of POST with data encoded as a query string (field1=value1&field2=value2) CSRF attack is easily implemented using a simple HTML form and anti-CSRF measures must be applied. Additionally, while typically described as a static type of attack, CSRF can also be dynamically constructed as part of a payload for a cross-site scripting attack, as demonstrated by the Samy worm, or constructed on the fly from session information leaked via offsite content and sent to a target as a malicious URL. CSRF tokens could also be sent to a client by an attacker due to session fixation or other vulnerabilities, or guessed via a brute-force attack, rendered on a malicious page that generates thousands of failed requests. The attack class of "Dynamic CSRF", or using a per-client payload for session-specific forgery, was described in 2009 by Nathan Hamiel and Shawn Moyer at the BlackHat Briefings, though the taxonomy has yet to gain wider adoption. A new vector for composing dynamic CSRF attacks was presented by Oren Ofer at a local OWASP chapter meeting on January 2012 – "AJAX Hammer – Dynamic CSRF". Severity metrics have been issued for CSRF vulnerabilities that result in remote code execution with root privileges as well as a vulnerability that can compromise a root certificate, which will completely undermine a public key infrastructure. The attacker must target either a site that doesn't check the referrer header or a victim with a browser or plugin that allows referer spoofing. The attacker must find a form submission at the target site, or a URL that has side effects, that does something (e.g., transfers money, or changes the victim's e-mail address or password). The attacker must determine the right values for all the forms or URL inputs; if any of them are required to be secret authentication values or IDs that the attacker can't guess, the attack will most likely fail (unless the attacker is extremely lucky in their guess). The attacker must lure the victim to a web page with malicious code while the victim is logged into the target site. Given these constraints, an attacker might have difficulty finding logged-in victims or attackable form submissions. On the other hand, attack attempts are easy to mount and invisible to victims, and application designers are less familiar with and prepared for CSRF attacks than they are for, say, password cracking dictionary attacks. Most CSRF prevention techniques work by embedding additional authentication data into requests that allows the web application to detect requests from unauthorized locations. Synchronizer token pattern (STP) is a technique where a token, secret and unique value for each request, is embedded by the web application in all HTML forms and verified on the server side. The token may be generated by any method that ensures unpredictability and uniqueness (e.g. using a hash chain of random seed). The attacker is thus unable to place a correct token in their requests to authenticate them. STP is the most compatible as it only relies on HTML, but introduces some complexity on the server side, due to the burden associated with checking validity of the token on each request. As the token is unique and unpredictable, it also enforces proper sequence of events (e.g. screen 1, then 2, then 3) which raises usability problem (e.g. user opens multiple tabs). It can be relaxed by using per session CSRF token instead of per request CSRF token. This technique is implemented by many modern frameworks, such as Django and AngularJS. Because the token remains constant over the whole user session, it works well with AJAX applications, but does not enforce sequence of events in the web application. The advantage of this technique over the Synchronizer pattern is that the token does not need to be stored on the server. Browser extensions such as RequestPolicy (for Mozilla Firefox) or uMatrix (for both Firefox and Google Chrome/Chromium) can prevent CSRF by providing a default-deny policy for cross-site requests. However, this can significantly interfere with the normal operation of many websites. The CsFire extension (also for Firefox) can mitigate the impact of CSRF with less impact on normal browsing, by removing authentication information from cross-site requests. The NoScript extension for Firefox mitigates CSRF threats by distinguishing trusted from untrusted sites, and removing authentication & payloads from POST requests sent by untrusted sites to trusted ones. The Application Boundary Enforcer module in NoScript also blocks requests sent from internet pages to local sites (e.g. localhost), preventing CSRF attacks on local services (such as uTorrent) or routers. The Self Destructing Cookies extension for Firefox does not directly protect from CSRF, but can reduce the attack window, by deleting cookies as soon as they are no longer associated with an open tab. Verifying that the request's headers contain X-Requested-With (used by Ruby on Rails before v2.0 and Django before v1.2.5), or checking the HTTP Referer header and/or HTTP Origin header. However, this is insecure – a combination of browser plugins and redirects can allow an attacker to provide custom HTTP headers on a request to any website, hence allowing a forged request. Checking the HTTP Referer header to see if the request is coming from an authorized page is commonly used for embedded network devices because it does not increase memory requirements. However, a request that omits the Referer header must be treated as unauthorized because an attacker can suppress the Referer header by issuing requests from FTP or HTTPS URLs. This strict Referer validation may cause issues with browsers or proxies that omit the Referer header for privacy reasons. Also, old versions of Flash (before 9.0.18) allow malicious Flash to generate GET or POST requests with arbitrary HTTP request headers using CRLF Injection. Similar CRLF injection vulnerabilities in a client can be used to spoof the referrer of an HTTP request. Cross-site scripting (XSS) vulnerabilities (even in other applications running on the same domain) allow attackers to bypass essentially all CSRF preventions. ^ a b c d Shiflett, Chris (December 13, 2004). "Security Corner: Cross-Site Request Forgeries". php|architect (via shiflett.org). Retrieved 2008-07-03. ^ a b Ristic, Ivan (2005). Apache Security. O'Reilly Media. p. 280. ISBN 0-596-00724-8. ^ Burns, Jesse (2005). "Cross Site Request Forgery: An Introduction To A Common Web Weakness" (PDF). Information Security Partners, LLC. Retrieved 2011-12-12. ^ Christey, Steve; Martin, Robert A. (May 22, 2007). "Vulnerability Type Distributions in CVE (version 1.1)". MITRE Corporation. Retrieved 2008-06-07. ^ Washkuch Jr., Frank (October 17, 2006). "Netflix fixes cross-site request forgery hole". SC Magazine. Retrieved 2019-02-11. ^ a b William Zeller; Edward W. Felten (October 2008). "Cross-Site Request Forgeries: Exploitation and Prevention" (PDF). Retrieved 29 May 2015. ^ Mike, Bailey (2009). "CSRF: Yeah, It Still Works…" (PDF). DEFCON. ^ "Security Advisory: CSRF & DNS/DHCP/Web Attacks". Draytek. May 2018. Retrieved 18 May 2018. ^ "Cross Site Request Forgery protection | Django documentation | Django". docs.djangoproject.com. Retrieved 2015-08-21. ^ "Cross-Site Request Forgery For POST Requests With An XML Body". pentestmonkey. Retrieved September 4, 2015. ^ Sheeraj Shah (2008). "Web 2.0 Hacking Defending Ajax & Web Services" (PDF). HITB. Retrieved September 4, 2015. ^ "Security Fix - Weaponizing Web 2.0". ^ Downloads – hasc-research – hasc-research – Google Project Hosting. Code.google.com (2013-06-17). Retrieved on 2014-04-12. ^ "Vulnerability Note VU#584089 - cPanel XSRF vulnerabilities". 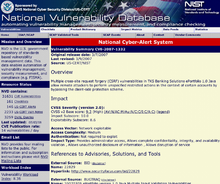 ^ "Vulnerability Note VU#264385 - OpenCA allows Cross site request forgery (XSRF)". ^ "Cross-Site Request Forgery (CSRF) Prevention Cheat Sheet". OWASP. Retrieved 2014-07-24. ^ "Valhalla Articles - Cross-Site Request Forgery: Demystified". ^ "Cross Site Request Forgery protection". Django. Retrieved 2015-01-20. ^ "Cross Site Request Forgery (XSRF) Protection". AngularJS. Retrieved 2015-01-20. ^ "Making a Service Available Across Domain Boundaries". ^ Adamski, Lucas. "Cross-domain policy file usage recommendations for Flash Player - Adobe Developer Connection". ^ "Double Submit Cookie defence". OWASP. ^ Origin Header Proposal. People.mozilla.org. Retrieved on 2013-07-29. ^ "Django 1.2.5 release notes". Django. ^ "Cross-Site Request Forgery (CSRF)". OWASP, The Open Web Application Security Project. 4 September 2012. Retrieved 11 September 2012. ^ "Secunia Advisory SA22467". Secunia. 19 October 2006. Retrieved 11 September 2012. ^ Schneider, Christian. "CSRF and same-origin XSS". This page was last edited on 9 April 2019, at 06:08 (UTC).